If you’ve ever wanted to join a superhero team made up of your friends, to fight a supervillain with plans to conquer the world… Sentinels of the Multiverse might be the game for you. 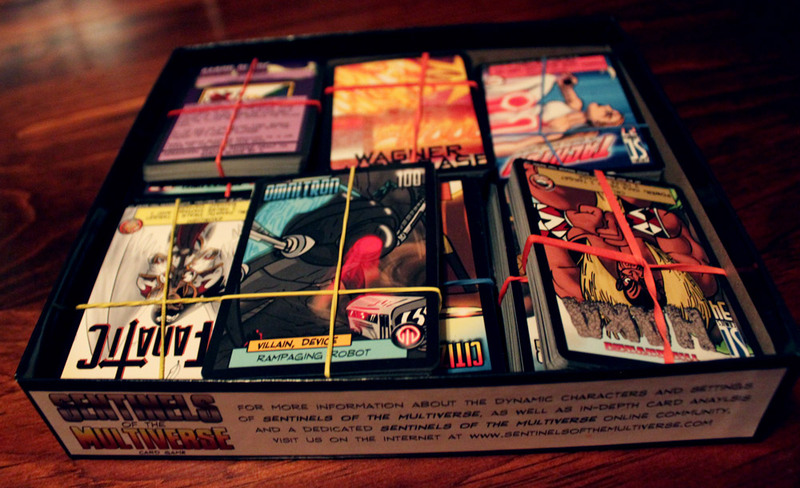 Sentinels is a cooperative card game in which each player chooses one of ten superheroes to team up against one of four supervillains within one of four possible environments. Sentinels of the Multiverse will be released at GenCon later this week, but you can check out our impressions below. Sentinels’ gameplay is pretty simple, mechanically. 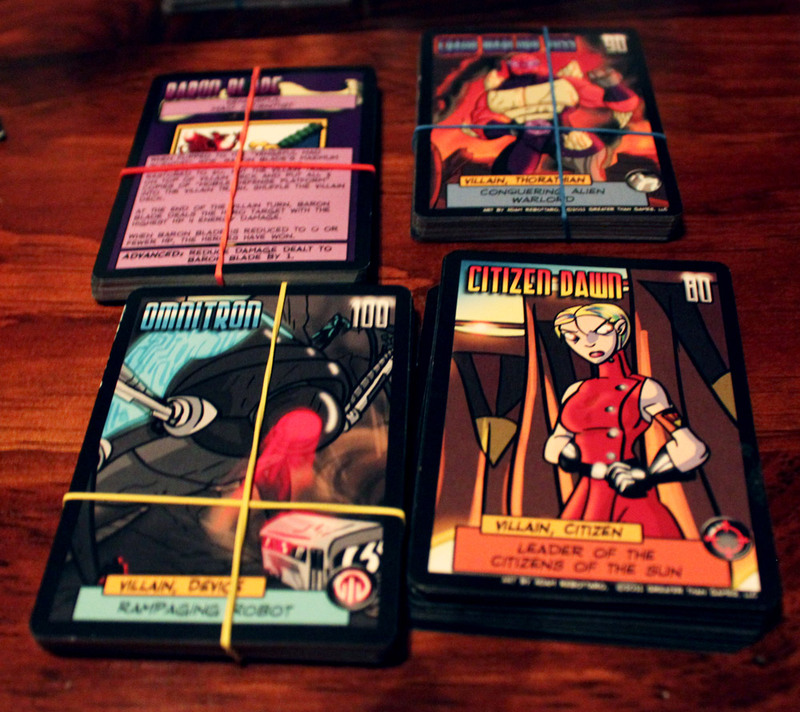 A round consists of each character getting a turn—starting with the villain, whose turn is automated, followed by each player’s hero, followed by an environment card. The villain turn is simply revealing a card from the villain deck and following its immediate instructions (if there are any). Cards, including the villain character card, also normally have effects that take place at the start of the villain turn or at the end of the villain turn as indicated. Each player has a single deck for their hero and starts with a hand of four cards from that deck, in addition to their hero character card, which lists an innate power. A player turn consists of playing a card from their hand, using a “power” from any card of theirs that is in play (including their hero character card), and then drawing a card. Some cards also have effects that take place automatically at the beginning or end of that hero’s turn. Finally, an environment card is drawn. Each environment card has some general effect, whether forcing players to discard cards of a certain type, increasing or decreasing the damage of certain damage types, or simply doing damage to certain characters. Sometimes environment cards benefit the players, but usually they damage them. The next round starts with the villain turn, and play continues until either all of the heroes are dead, another victory condition for the villain is met, or the heroes destroy the villain and satisfy any extra victory conditions. For me, Sentinels is enjoyable overall with a few flaws that occasionally break the experience down. The art and overall design of the cards, box, and even instruction booklet are excellent. They really capture a comic-booky, superhero feel. There are quotes with references to fake issue numbers, colorful and detailed images to go along with card powers, and just a general over-the-top fun superhero feel to everything. That adds a lot to the game and contributes to the spirit of superhero teamwork. The most annoying thing about this game is that you have to keep track of hit points. With no included tokens or markers, you need to find a pen and a piece of paper to track hit points for all the heroes, the villian, and any lackeys or environment cards that have hit points. It can get pretty tedious when you have four or five minions (or drones, or citizens…) out on the table who have all taken two to three damage. And it’s not very conducive to each player tracking their own HP when damage is dealt out by who has the most or least hit points. Even a few tokens for minion damage would have made it a lot easier. Each hero has its own deck, and the decks are designed very well. Cards are designed to interact with each other and that hero’s power in a unique way relative to the other heroes, making each hero feel different. Visionary can look through villain and environment decks and control what will happen next. Legacy is a team player and boosts the stats of the other heroes. Tempest creates storms that damage a large number of minions or heal heroes. Wraith uses technology to redirect damage and protect herself. Absolute Zero absorbs cold damage as health and can redirect fire damage to other targets. Many cards stay on the table once they’ve been played, so the heroes get more and more powerful as the game goes on. It’s really fun to see hero powers interacting with each other, making it feel like a team. One of the best moments was when Ra (a hero) sent a powerful Fire attack against Absolute Zero, instead of the enemy, because Absolute Zero could increase the damage and retarget it against the villain. These are the moments that make you truly feel like a superhero team. However, some cards are not worded quite as clearly as they could be. Sometimes this is due to unclear wording, sometimes because of inconsistency between cards; sometimes just because it felt like a line of instruction was missing. Example: both Tempest and Absolute Zero have a card that deals damage to a single target at the start of their turn. However, Absolute Zero’s version has one additional instruction: when the target is destroyed, then destroy the card. Tempest’s version is missing that instruction, so when it came up, we weren’t sure what to do with it. It made sense that it would go away like Zero’s, but the fact that Zero’s card clarified and Tempest’s didn’t had us at a loss. Some of these moments can be clarified in the rules posted on the website, but hopefully future printings will clear up most of these issues. The way it is now, though, you’ll probably have to make a house rule in some scenarios just to move the game forward. It is possible for a Hero to “die” (or become incapacitated), but instead of that player being eliminated from the game, the hero lose all of their cards and flips their hero card over. This grants them alternate abilities that allow them to keep playing. This is a great method, although in some cases the “incapacitated” abilities seem as strong or stronger than the hero’s abilities before they died. Unfortunately, I do have to complain that there is not a great “arc” to the game. A good combat arc would involve rising intensity to reach an epic climax followed by a quick resolution. Sentinels hits the climax about halfway, and you spend the rest of the game whittling down the villain’s HP after getting their supply of minions under control. It is exciting to take out a group of lackeys or block a major attack, but when you get to the point of circling around as each player knocks two to three HP from the villian’s total, take a little damage, rinse, repeat, it can get a little dull. In addition, sometimes the environment cards seem to do more damage than the villian him- or herself. Which is weird. I think Sentinels actually avoids the problem of many co-op games of a single player taking “command” and just telling everyone what to do. Each player needs to manage their cards in hand and in play, and it is nearly impossible to manage yours and every other player’s, forcing each player to contribute. That’s good. 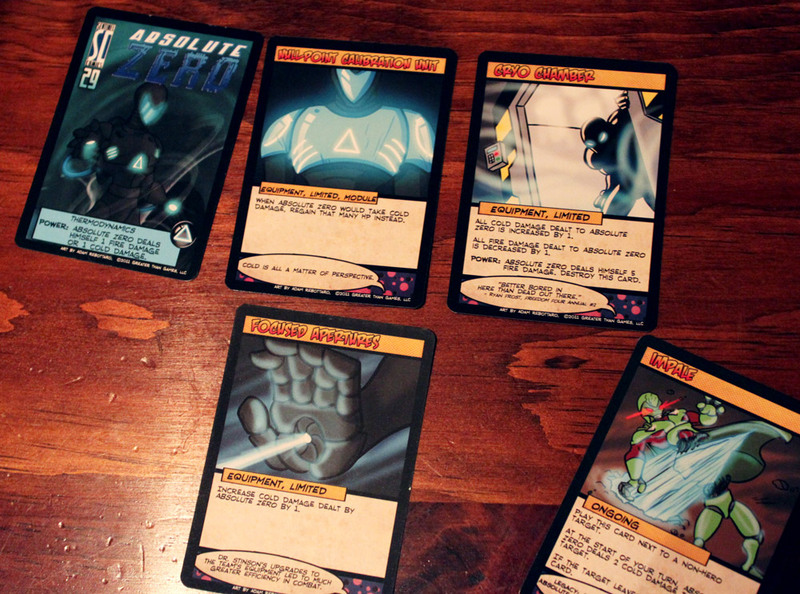 Sentinels, however, does not escape one thing that often plagues cooperative games: sometimes, if the wrong cards come up early in the game, you can lose really really quickly without even having a chance. There’s nothing you can do when that happens—you just get totally blasted, even if you didn’t make bad choices. The game instructions recommend four players. Three- or five-player games are doable, but five players make it pretty easy and three are more likely to succumb to overwhelming force early on. I would recommend trying to get four, as that hits a good balance of tension without being too overwhelmed. Playing with two people requires one or both players to play as two heroes, and I do not recommend this. It’s way more fun playing as an actual group than trying to manage multiple heroes. On a side note, the packaging is pretty pathetic. There are no inserts for managing cards once the plastic wrap is removed, and if you don’t add rubber bands or baggies or something, the game will be a mess every time you open it. With eighteen different decks to keep separate, you’re going to want to avoid having to reassemble those decks every time. All-in-all, I think Sentinels is a very fun cooperative game. While it has a few flaws, it is thematically strong and the kind of game that is enjoyable because of its theme. It plays in about an hour (a little longer with new players who are just getting used to how the cards and abilities interact), so it makes a decent lunch game. I haven’t played this game quite as many times as @Futurewolfie has, so I didn’t run into some of the problems he did. You can factor that in when you consider my (brief) remarks. I think Sentinels of the Multiverse, while having a few flaws, is still super fun. I’ve mentioned before that theme doesn’t affect me too much in terms of whether or not I’ll like a game. While that’s true, I am a huge sucker for the superhero genre, and Sentinels of the Multiverse delivers there in spades. @Futurewolfie mentioned the card art and design, and I would like to echo what he said: well done, Greater Than Games. They have succeeded in creating a new superhero world that is enjoyable to spend time in and almost makes you wish for those fake comics they’re referencing throughout. What I think Sentinels of the Multiverse really has going for it is variety. With ten different heroes fighting four possible villains in one of four possible environments, and with the possibility for expansions, the options are great, and gameplay should keep from getting stale. I love that there are multiple environments that impact the game. Every epic superhero battle should be fought somewhere, and I appreciate the added challenge that these cards provide (though, as Wolfie mentioned, occasionally they are more challenging than the villain, which seems out of balance). I like that each hero feels different, even if the core mechanics of controlling the heroes are the same. I played as Haka and Absolute Zero, and the only similarities between them are that both characters use a deck of cards and both of them have superpowers. I like this. I also like that the villains have two “modes,” one regular and one supercharged mode. This keeps the game interesting as the villain you thought you were fighting can become more powerful in an instant. This forces players to stay on their toes. I echo Wolfie’s concern about tokens and keeping score. It would be nice if they were included in the box (and an insert would have been doubly nice), but I think most players will have something like this about. I think tokens for the little minions would work best and a common scorekeeper for the heroes and villain would be fine. This game is perfectly suited for an electronic counterpart because scorekeeping would not be tedious and damage modifiers would be easy to keep track of, keeping players more focused on destroying dastardly deviants. Still, this isn’t a deal-breaker for me, and I don’t fault a start-up company for only including the cards. They did a great job on those, and that’s enough for me. I am cautious about cooperative games in general because I fear that they will be too easy or too nice. This fear is misplaced when it comes to Sentinels: the first game I played, we got s-l-a-u-g-h-t-e-r-e-d; we didn’t stand a chance. The second game carried the right amount of tension: it looked like we would lose, but we made a heroic comeback and beat the villain with each hero having between one and five hit points left (of the base 25-35). One of our number fell, but he was almost more valuable in death. And I like that players are not eliminated and that they still have a huge impact after they die. What I don’t like about this game is that the player turns of one card, one power go pretty slow at first (while you’re learning), and it feels like learning to dance rather than dancing. And, unfortunately, it’s a slow dance. The game lags, and you are almost ready to quit. However, after players get the hang of what they should be doing (around the middle of the first game), Sentinels becomes much more fun and engaging. As each player’s turn takes thirty seconds rather than two or three minutes, the speed and immediacy of a superhero battle becomes apparent. Then all of a sudden it’s Dance, Dance Revolution. I guess this game is more accurately described as “Come Sail Away” by Styx: it starts off slow, but by the end you’ve hit the groove and are singing about spaceships and aliens. Sentinels of the Multiverse won’t appeal to everybody, and the game mechanics could use a little streamlining, but what’s included in this package is certainly worth checking out. If you’ve ever wanted to don a cape and tights, this game may be for you. 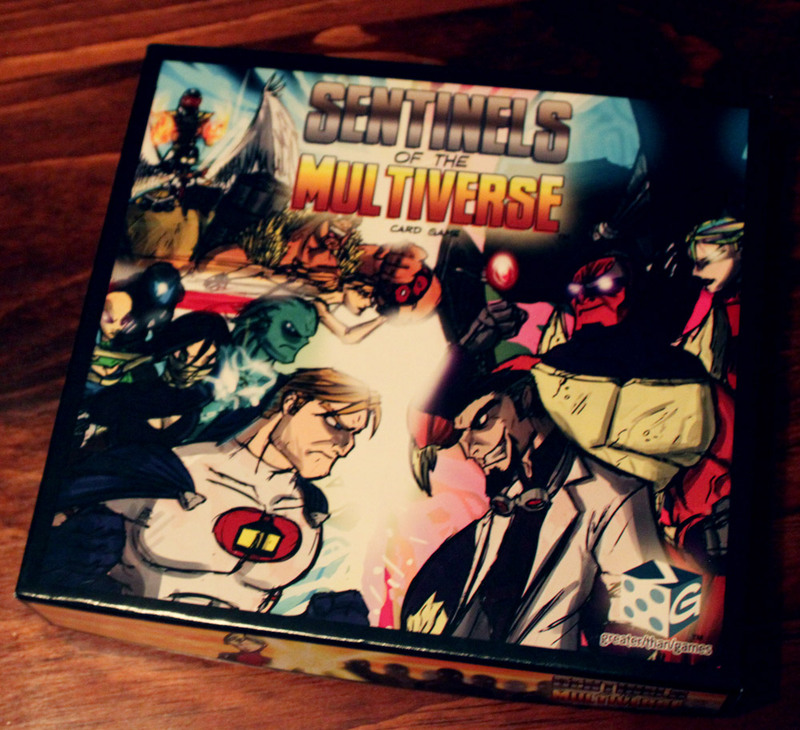 Again, Sentinels of the Multiverse will be releasing at this year’s Gencon, so if you will be there, I highly recommend giving their table a visit. Game packaging is pathetic, which means sorting out the cards whenever you open the box. Previous ArticleFriday Question: Do You Use House Rules?